10 E&MJ • JUNE 2018 www.e-mj.com COMPANY PROFILE-PAID ADVERTISEMENT Addressing Water and Site Challenges with Unparalleled Technical Services The world's constant demand for metals, minerals and aggregates is driving mining companies to optimize operations in both water- scarce and water-abundant regions. Complete site-wide water management strategies that improve mine safety, protect assets and improve ore recovery are critical for a successful mine. 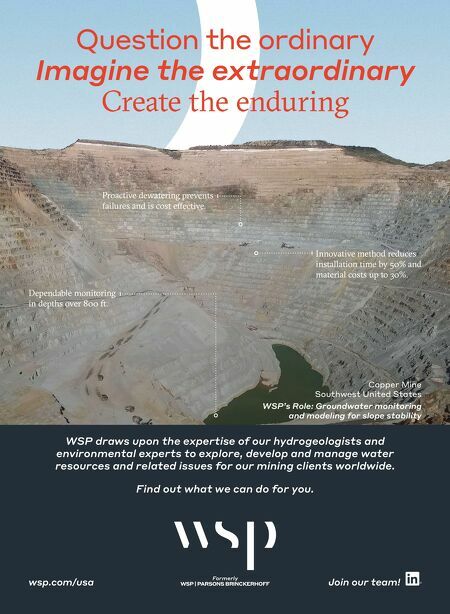 WSP's application of proprietary technologies and field techniques greatly increases our understanding of subsurface conditions which allows us to develop innovative workflows to improve operational performance and safety. Groundwater Flow and Transport Modeling Mining operations face a number of challenges throughout the life of mine related to groundwater from pore pressure to plume monitoring to planning for closure. 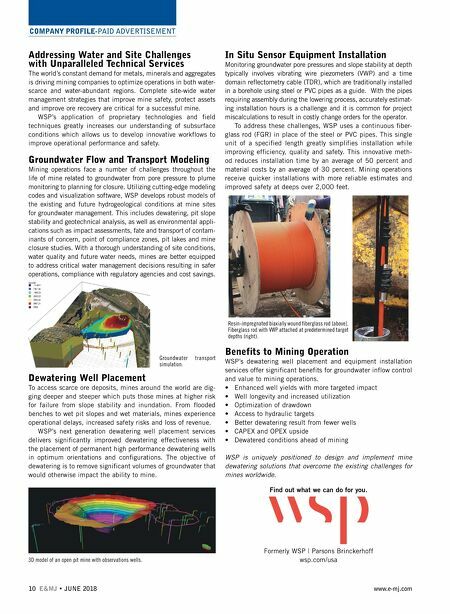 Utilizing cutting-edge modeling codes and visualization software, WSP develops robust models of the existing and future hydrogeological conditions at mine sites for groundwater management. This includes dewatering, pit slope stability and geotechnical analysis, as well as environmental appli- cations such as impact assessments, fate and transport of contam- inants of concern, point of compliance zones, pit lakes and mine closure studies. With a thorough understanding of site conditions, water quality and future water needs, mines are better equipped to address critical water management decisions resulting in safer operations, compliance with regulatory agencies and cost savings. Dewatering Well Placement To access scarce ore deposits, mines around the world are dig- ging deeper and steeper which puts those mines at higher risk for failure from slope stability and inundation. From flooded benches to wet pit slopes and wet materials, mines experience operational delays, increased safety risks and loss of revenue. WSP's next generation dewatering well placement services delivers significantly improved dewatering effectiveness with the placement of permanent high performance dewatering wells in optimum orientations and configurations. The objective of dewatering is to remove significant volumes of groundwater that would otherwise impact the ability to mine. In Situ Sensor Equipment Installation Monitoring groundwater pore pressures and slope stability at depth typically involves vibrating wire piezometers (VWP) and a time domain reflectometry cable (TDR), which are traditionally installed in a borehole using steel or PVC pipes as a guide. With the pipes requiring assembly during the lowering process, accurately estimat- ing installation hours is a challenge and it is common for project miscalculations to result in costly change orders for the operator. To address these challenges, WSP uses a continuous fiber- glass rod (FGR) in place of the steel or PVC pipes. This single unit of a specified length greatly simplifies installation while improving efficiency, quality and safety. This innovative meth- od reduces installation time by an average of 50 percent and material costs by an average of 30 percent. Mining operations receive quicker installations with more reliable estimates and improved safety at deeps over 2,000 feet. Benefits to Mining Operation WSP's dewatering well placement and equipment installation services offer significant benefits for groundwater inflow control and value to mining operations. • Enhanced well yields with more targeted impact • Well longevity and increased utilization • Optimization of drawdown • Access to hydraulic targets • Better dewatering result from fewer wells • CAPEX and OPEX upside • Dewatered conditions ahead of mining WSP is uniquely positioned to design and implement mine dewatering solutions that overcome the existing challenges for mines worldwide. Find out what we can do for you. Formerly WSP | Parsons Brinckerhoff wsp.com/usa Groundwater transport simulation. Resin-impregnated biaxially wound fiberglass rod (above). Fiberglass rod with VWP attached at predetermined target depths (right). 3D model of an open pit mine with observations wells.